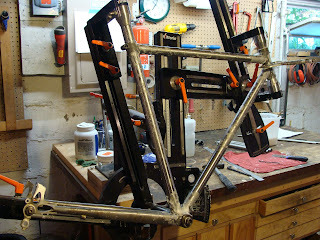 I finished up Selena's frame last Friday and it's already off to Jason's for paint. 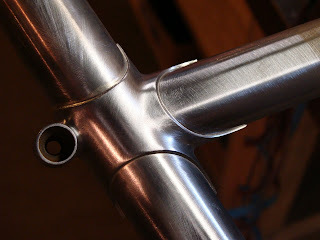 I tried to take some photos of the progression as the different parts of the frame come together. 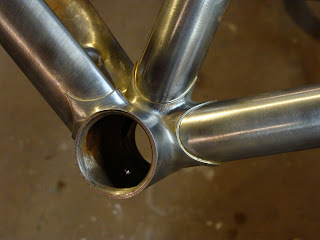 Firstly, let me begin by saying, this was a fairly small frame, a 48cm c-c. 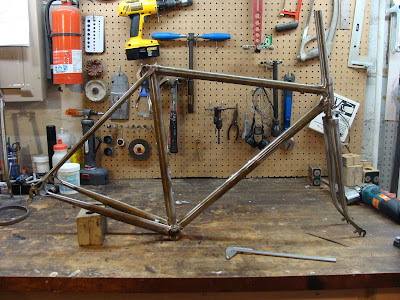 Many times when I was building frames at Serotta and Waterford I felt like we overbuilt small frames. 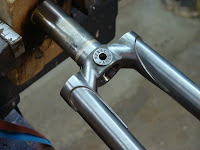 One of the nice things about doing Ellis frames is that I'm really not constrained by a lug or tube set that is "stock", so on this frame I decided to use fairly thin standard gauge tubing for a more proportional ride. (If that makes sense?) 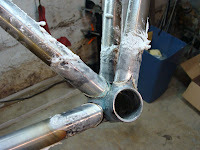 Weight wise, the frame ended up at about 3 1/4 lbs. 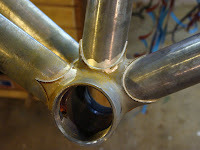 Above is the frame all fluxed up and ready for tacking. 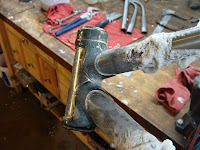 Here's the progression from freshly brazed, to soaked, to finished seat lug. I did some small points on the seat stay caps and just wrapped them a bit. 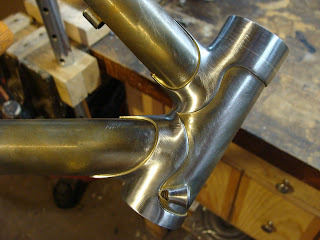 Same progression with the head lugs. I used Henry James lugs on this one for a couple reasons, he makes a pretty nice selection of angles, so I don't end up having to "tweak" the angles much, and the shapes of his lugs are just nice, with very pleasing curves and transitions. 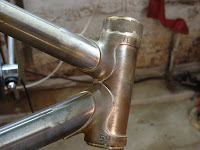 The head lugs really finished up nice, I butted them together since the frame is so small, and added the 10mm head tube extension on top. 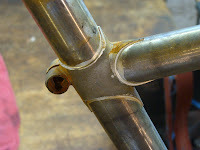 Again, a few shots of the bottom bracket. 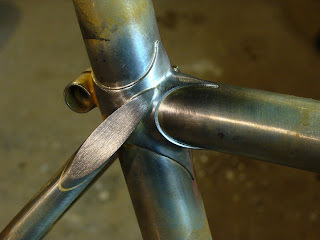 Brazed, soaked and finished. 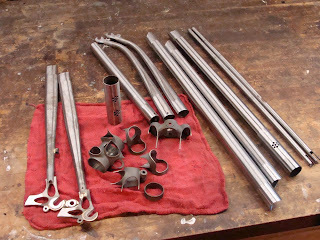 Finally, the fork and front dropouts. 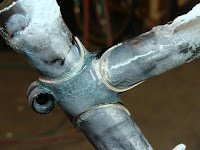 How do you decide - absent rider preference on the tubing you would use on a bike? 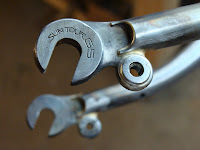 If you have a lightweight rider (under 120) who might also sport a load of 20 lbs for commuting but mostly rides load free would that influence your tubing selection? Or is that not enough to make a difference?